Playful geometry breaks this backyard into dining and seating circles. 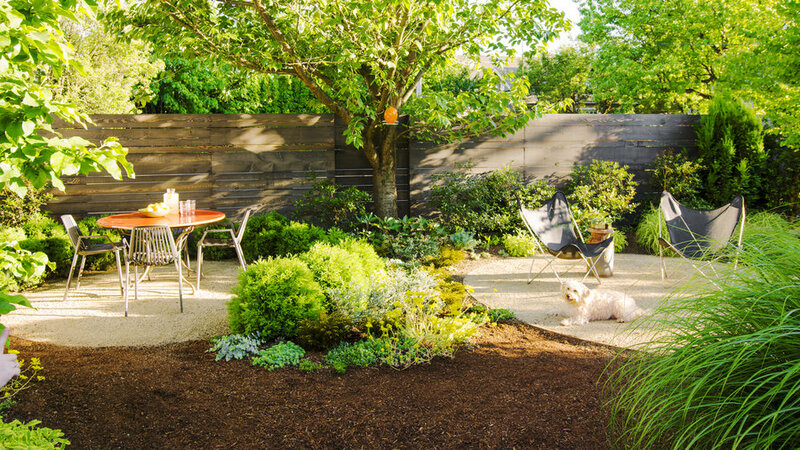 The circular landing pads filled with decomposed granite are great for lounging and dining in the backyard, edged by easy-care plants all soft and sturdy enough to withstand dogs—who can run around in the unplanted, unpaved space. Fat, dwarf Atlantic white cedars (Chamaecyparis thyoides ‘Heather Bun’) enclose the 10-foot-wide dining area, while ornamental grasses, shrubs, and perennials define the 12-foot-wide seating space. A flowering cherry (Prunus serrulata ‘Kwanzan’) shades both circles. Plants with soft, sturdy foliage, such as ornamental grasses, can stand up to dogs without injuring them. Along the side of this house, large clumps of maiden grass (Miscanthus sinensis ‘Adagio’) are the perfect height to provide greenery without blocking the view from the windows. Pink-hued plumes emerge later in summer. The grass holds its shape all winter and needs just one shearing in early spring. 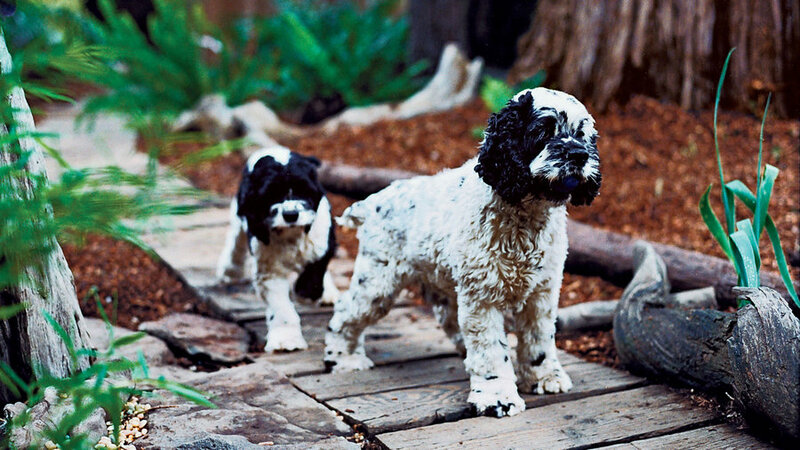 Use paw-friendly paving materials, such as splinter-free bark mulch and flagstone. 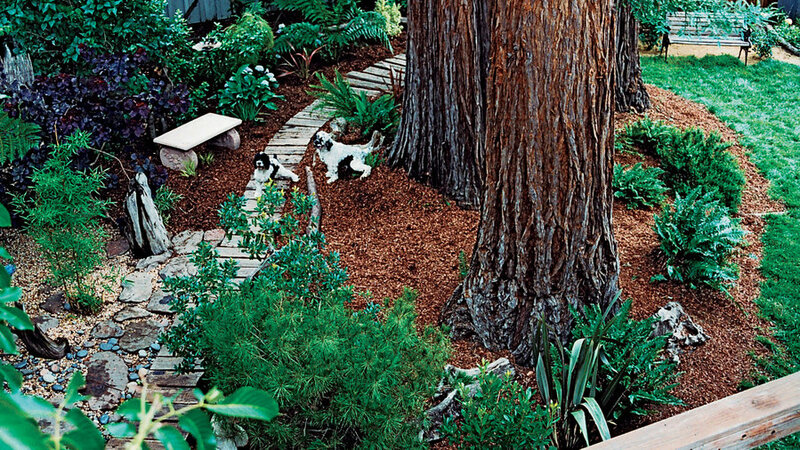 Here, a 4-inch-thick layer of bark mulch along with hard-packed decomposed granite keep the unplanted expanses weed-free. 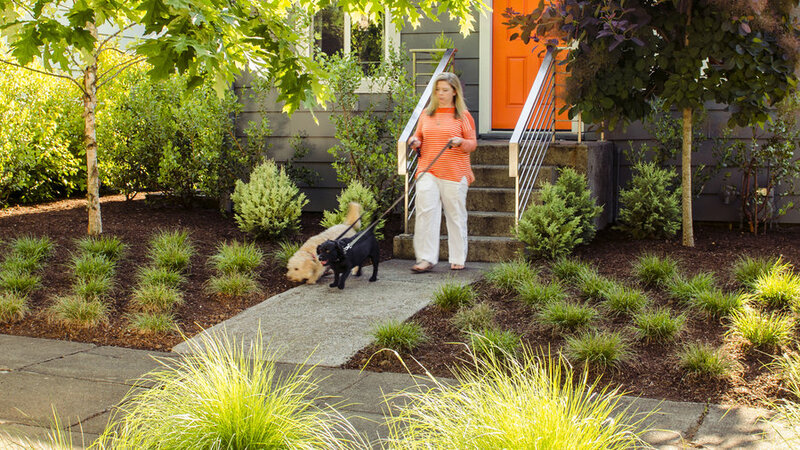 With that kind of open space to play, the homeowner's three dogs haven’t done any harm to the garden’s plantings. In this front yard, the homeowner installed a meadow of sturdy, no-mow fountain grass (Pennisetum alopecuroides ‘Hameln’) instead of turf, for lower water usage and maintenance. Purple smoke tree (Cotinus ‘Grace’) and river birch (Betula nigra) flank the entry. Evergreen manzanita (Arctostaphylos x densiflora ‘Austin Griffiths’) and dwarf Atlantic white cedar (Chamaecyparis thyoides ‘Iceberg’) fill in near the house. If you were a dog, what would you want? Each breed has a different personality. The better you can accommodate its particular traits, the happier your dog. And the happier your dog, the better your chance of maintaining a garden you'll both enjoy. 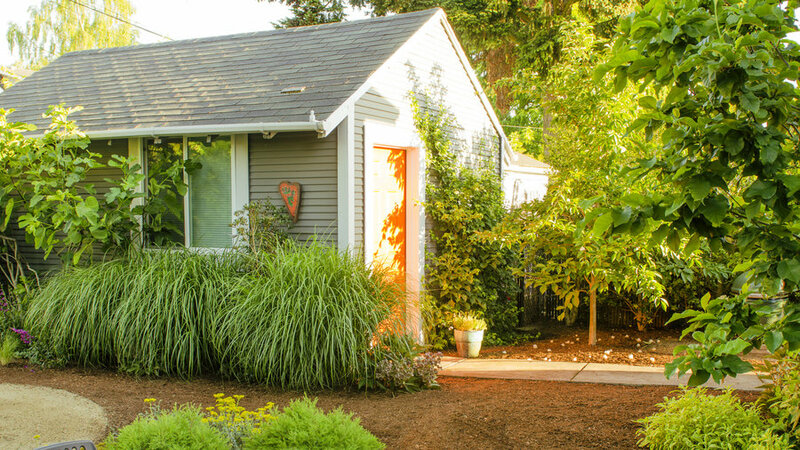 This dog-friendly yard includes a running track, border control, comfy mulch, sensible plants, and a piece of driftwood to serve as a marking post. Like humans, dogs enjoy basking in the sun. So by all means, give them a deck or a patch of lawn for sunbathing. But remember that dogs can overheat easily, so it's even more important to provide them with cooling retreats. 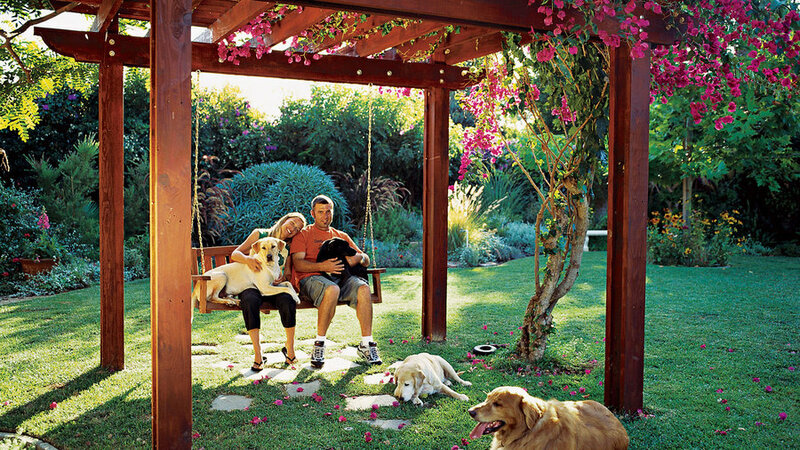 Here, 4 retrievers (liko, Lexi, Andy, and Morgan) enjoy resting under an arbor in Oceanside, CA. Dogs need exercise; paths give them a designated space to do it as well as a venue to perform their perceived job―to patrol your property line. Readers suggested sacrificing a few feet along the fence for a perimeter path to simultaneously satisfy both needs. If your dogs have already created their own paths through the garden, don't try to redirect them. Instead, turn their well-worn routes into proper pathways. A 3-foot-wide clearance is enough for most dogs. 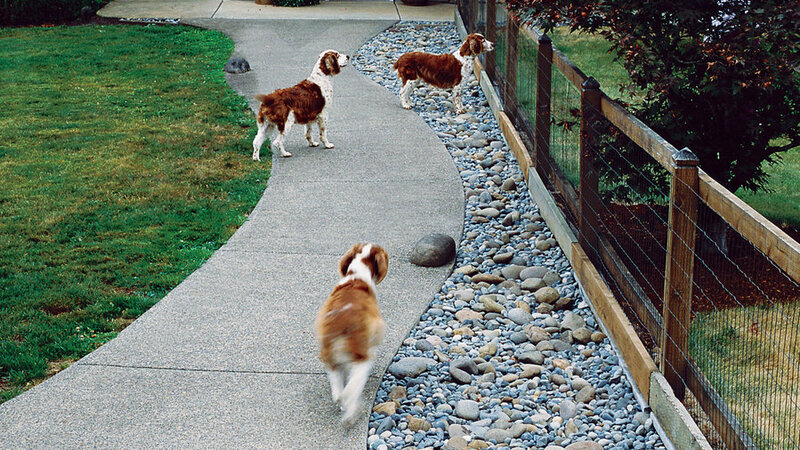 Plant a screen to hide this dog run if you like; pets seem to like having their own "secret garden." Dogs will happily share arbors, pergolas, and other shade structures with their owners. But most dogs seem to appreciate having a shelter of their own, such as a doghouse. 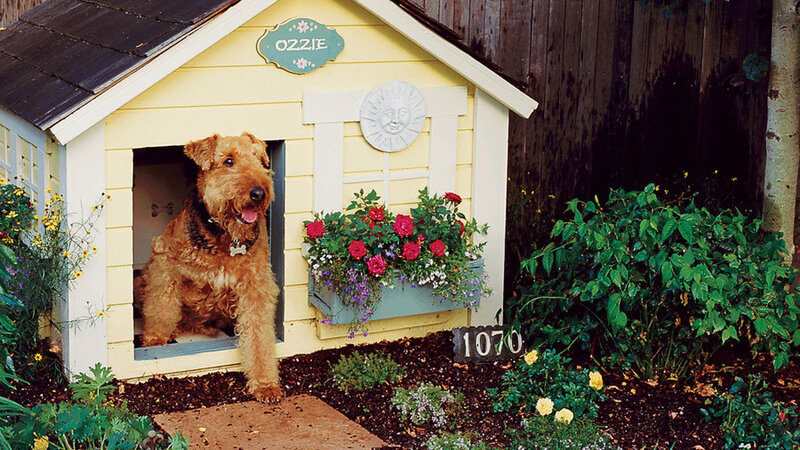 Here Ozzie the Airedale has a cottage-style house, complete with window box, in Denver. If you have a Houdini and need to keep your escape artist from tunneling under the fence, you may need to install an underground barrier made of rebar, chicken wire, or poured concrete. Here, a fence underlined with boards keeps 4 Welsh springer spaniels from tunneling into the front yard in Battle Ground WA. 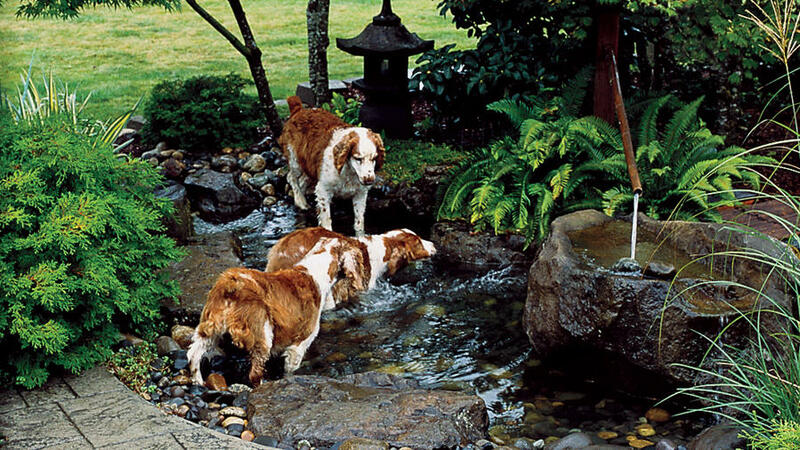 These lucky Welsh springer spaniels wade into a cool, safe pond in Battle Ground, WA. 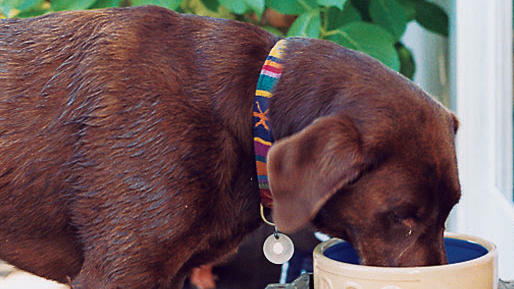 Lucy Ball, a chocolate lab, drinks from a raised dining area in Mill Valley, CA. The platform helps keep the area tidy and serves as a storage for the owner's garden clogs. 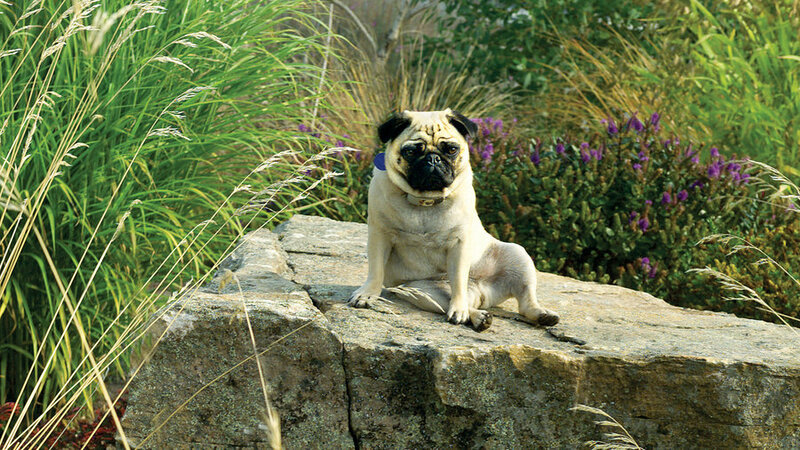 Hester the pug likes to survey the world from her rocky perch in a West Seattle garden. If you plant landscaped areas densely, dogs will generally stay out. Still, most dog owners recommend additional precautions: Plant in raised beds or on mounds, and start with 1-gallon or larger plants. Put up temporary fencing around newly landscaped areas; when you remove it, add a rock border or low fencing as a reminder to stay out. Plant romp-proof shrubs and perennials like ornamental grasses around the edge of the garden. Put brittle plants like salvias in the center, where they'll be protected. 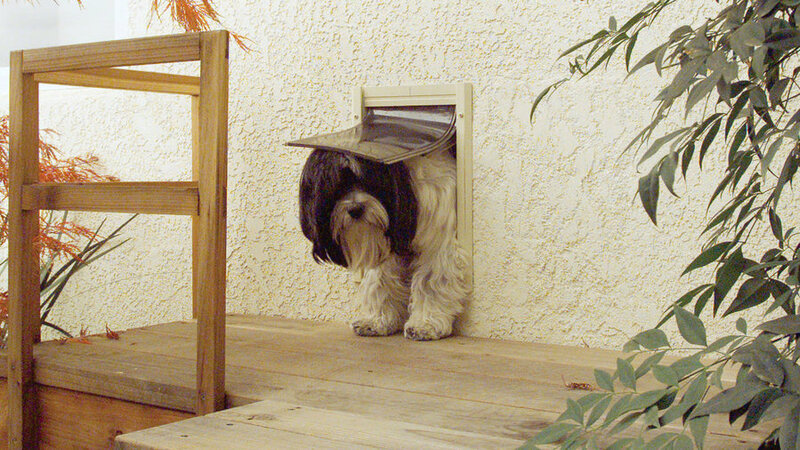 Anastasia, a Tibetan terrier in Shingle Springs, CA, gets to her backyard through a dog door.